Have you ever walked down the refrigerated juice aisle of the store and get overwhelmed with all the healthy juice options?? I do. As much as I love eating and drinking healthy it can be quiet overwhelming when I comes to finding whats good. Well friends, Suja Juice is what's good. I had my first Suja about 1.5 years ago at a conference and I was hooked. They can be found just about everywhere now. I've seen them at Target, Whole Foods, Publix (for us southerners), and Walmart. They are one of the best cold press juices I've tried on the market. Plus they don't break the bank! Side Note: Publix shoppers. These babies go BOGO at least once or twice a month. So STOCK UP! Whats SO great about Suja?? They're...USDA Certified Organic, GlutenFree, Kosher, Non-GMO Project Verified, and Cold Pressured. Cold Pressured refers to the process by which fresh food products, such as juice, are preserved using High Pressure Processing (HPP) as opposed to high heat. This process extends shelf life & helps to maintain essential vitamins, minerals & enzymes. My two favorites are Berry Goodness and Mango Magic. The berry is a great sweet treat filled with tons of goodness! Its definitely my "go to" when I'm shopping and need a pick me up! I've even gotten sweet little kiddos hooked on it after I let them have a taste. So let it be known that even 3 year olds will drink it!! They are great for on the go too! I find myself often putting one in my purse for later on in the day. 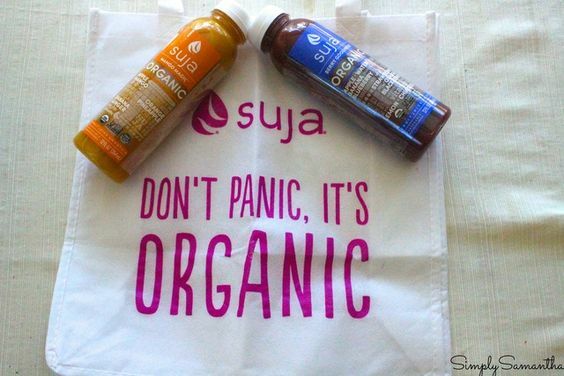 Find where Suja Juice is sold here! (Declaimer) I was given coupons in order to try and review this product as part of a Mom's Meet program. Opinions are 100% my own.